As with many issues, I’ve changed my mind about some mulching through the years. Mulching the bare soil is still a major part of my recommendations for the overall organic program, but there have been some fine-tuning as well as some major changes. Mulching the bare soil around plants helps by keeping the moisture in the soil for a longer period of time, preventing erosion from wind and/or water, and maintaining the biological life and soil surface temperature at an ideal level. I originally recommended pine bark mulch. Everybody did. 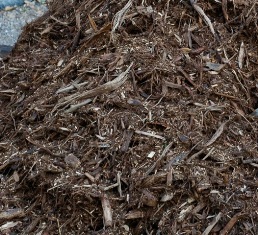 The entire landscape industry used pine bark mulch almost exclusively up until the mid 70’s. It took me a while to notice that pine bark wouldn’t stay in place well and to learn that it contains some natural chemicals that are not helpful to plant growth. It’s interesting that pine needles don’t have these issues and make good mulch. During the late 70’s, I became interested in mulch called shredded hardwood bark that had become available from the forestry industry in east Texas. After using it on two or three jobs, it became apparent to me that it was a far superior product because it looked better, held in place well and seemed to break down and help grow the plants much better than pine bark. It was a struggle getting the industry to change. In fact, much of the industry and some of the horticultural advisors that should know better are still recommending pine bark mulch not only for regular bed preparation and mulching, but also as a key ingredient in the mixture for azaleas. One so-called horticultural expert had the contractor remove all the hardwood mulch from one large commercial project, saying “we’re not using anything that Howard Garrett recommends”. Later I changed my primary mulching recommendation again - to cedar mulch. Cedar seemed to be far superior in several ways. First of all, it recycles a local product that many people consider a big weed. Secondly, it smells terrific and the fragrance will deter some insect pests. It even seems to have some positive effect on diseases. The main point however is that cedar mulch looks good, locks into place like the shredded hardwood bark, but breaks down into humus even more effectively, thus helping plants grow better than any other mulch. The best cedar mulch is freshly shredded cedar, not the finely ground-up material. People tend to like the finely ground cedar from a cosmetic standpoint. That’s fine, but from a horticultural standpoint, the raw, larger textured shredded material is better. Once cedar has started to break down, which happens fairly quickly, it can still be used as mulch, but the most effective use at this point is around small plants including annuals and small perennials. It is not the best mulch at this point for shrubs, trees and other larger plants. In this fine texture, it can be used as a bed preparation soil amendment. My latest change or recommendation is a switch from pure cedar to shredded native tree trimmings, which is usually a mix of tree and shrub types. The best mulch for any site anywhere is recycled plant material (leaves, twigs, spent plants, buds, bark, flowers and other plant debris) that grew on that property. That's the natural way it is done in the forest and on the prairie. I’ve changed my recommendation on mulching trees as well. I used to recommend a thick layer of mulch across the entire disturbed area after the tree was planted. Now the recommendation is to taper the thickness of the mulch from 0” at the trunk to 3 – 5” at the outer edge of the disturbed area. In the past, I was not as concerned as I should have been about piling mulch on the trunks of trees. Mulching plants in containers is a little different issue. The shredded cedar still works very well, but the fine texture material is better in most cases unless the pots are very large. There is mulch that works almost as well and also helps to eliminate the problem of squirrels digging out the potting soil and ruining the plants. It is lava gravel, not the lava sand that we use for bed preparation, but the large lava gravel. It is available in red, black or a mixture of the two. It’s not as good because it doesn’t break down into humus as shredded tree trimmings do. In conclusion, any mulch is better than no mulch, but there are some mulches that I strongly recommend avoiding. Cypress isn’t good because it doesn’t break down well and its harvest and transportation are environmental problems. The dyed woods contain unnecessary chemicals and are ugly. Paper products are artificial looking and won’t stay in place. Plastic fabrics and shredded rubber mulches should never be used. Products are available in the Dirt Doctor's Destination of your favorite Garden Center.